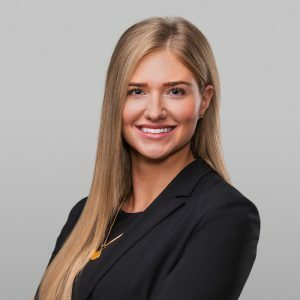 Kelci Binau is an Associate in the firm’s Business Entities & Transactions and Real Estate & Land Use practice groups. She handles a variety of transactional, land use and real estate matters for clients. Ms. Binau was a Legal Extern for the Honorable Chief Judge Beesley & Judge Zive’s Chambers, U.S. Bankruptcy Court. She conducted legal research of issues presented in motions and preparation of summaries for presentation to judges, prepared memoranda on various legal issues for judges in preparation for hearings, and observed court hearings, oral arguments and discussed with judges the Court’s rulings. She was also a law clerk for Demetras & O’Neill and Barbara Gruenewald. Ms. Binau received her J.D. with great distinction from the University of the Pacific, McGeorge School of Law with a concentration in tax and business in 2018. She graduated in the top ten percent of her law school class and was named to The Order of the Coif and the Traynor Honor Society. She also served as the Primary Editor, Comment Staff Writer and Legislative Staff Writer for the McGeorge Law Review, as well as the Research Assistant for Director of Tax, Professor Christine Manolakas. She received her BA in Speech Communication and her Masters of Elementary Education from the University of Nevada, Reno.